Locating your washer and dryer in your kitchen or bathroom can mean constant disruptions to family routines. Did you know that the average American spends more than eight hours a week doing laundry? Collectively, they wash and dry more than 35 billion loads of laundry every year. With all those loads to do, it makes sense to have one room dedicated to the job. 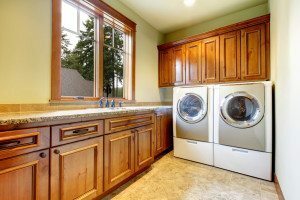 For that reason, many homeowners are upgrading by adding a laundry room to their home. Following is a look at the advantages of a laundry room and how to design one. In earlier years, many homeowners put washers and dryers in the basement, often down a steep flight of stairs, off in a dank corner. This got the noise and mess out of the way, but it was inconvenient to get to — hauling laundry up and down steps is tedious and can even be dangerous. Some people put the appliances in the kitchen or bathroom to make them more accessible. They were easy to get to, but it made it difficult if other family members needed to use the bathroom or the kitchen at the same time. Cramped hall closets were a popular location for a while, but today, this is a sure sign of an outdated home design. Building a room specifically designed for laundry makes life easier for everyone. Putting the laundry room next to, but separate from, the family room lets a parent watch the kids and the clothes at the same time. Adding a laundry room next to the kitchen keeps the clothes and mess out of the food prep area, but close enough to quickly move a load from the washer to the dryer between working on other tasks. Designing the purpose-built laundry room lets you put in shelves for detergents, irons and other necessities. You can put in plenty of counter space to make folding and sorting easy. Not only do you gain the benefit of a dedicated space, you improve your home’s organization at the same time. Interior design professionals recommend designing your laundry room around the tasks you need to do there. Use the motto “form follows function” when you make your plans. Your principle chores are sorting, washing, drying, folding, hanging and possibly ironing. That means you need to arrange this compact space to make it easy to switch clothes from hampers to washer to dryer to folding table. Add a clothes rod close to the dryer for shirts and other items that tend to wrinkle. Put your shelves at eye level so it is easy to grab the right item. Add more shelves and counter space than you think you’ll need. You can never have enough. Remember to add a big laundry sink. These haven’t outgrown their usefulness. Besides being a great spot to wash the dog, they let you hand wash delicate items and soak larger ones, and they’re ideal for those messy cleanup chores you hate to do in the sink or tub. For efficiency, divide your plans into zones for wet and dry tasks. Put the sink and the washer next to each other, and the clothes rod and counter space next to the dryer. If you want to use your ironing board in the laundry room, be sure to leave enough space to easily set up the board and stay comfortable while you iron. A laundry room can make the never-ending chore of clean clothes much simpler. Spend time on design and arrangement to make the most of your washer and dryer installation. 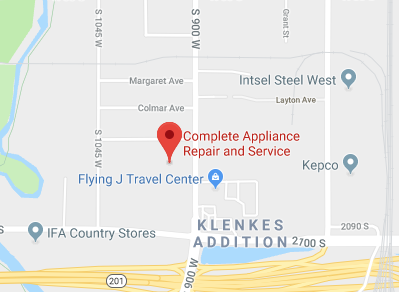 When you’re ready to select and install your new laundry room appliances, call on Complete Appliance Repair, serving North Salt Lake, Utah, and the surrounding communities. Providing sales, installation and service, Complete Appliance is northern Utah’s premier service provider for washer and dryer installation. This entry was posted in Blog and tagged Laundry Room advantages, Laundry Rooms on August 4, 2015 by admin.